Whats the deal with FODMAP stacking? Should you take Digestive Enzymes? 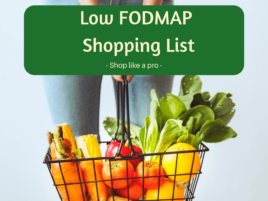 Is Greek Yoghurt low FODMAP? Whats the Deal with Coffee & IBS? Does your Period make IBS worse? 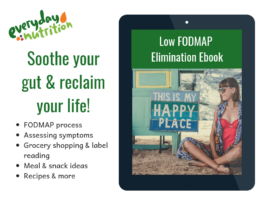 Why do I react to Low FODMAP Foods? What is Healthy Eating Anyway? 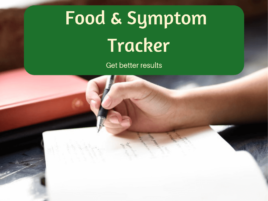 Gluten or FODMAPs & Does it Matter? Since it has been 54 months now that Dietitians around the world have been “ReDuxing” recipes to “inspire the food lover in every healthy eater and inspire the healthy eater in every food lover”, this month’s theme is to grab the nearest cookbook and ReDux the recipe on page 54 or 154. I personally believe that good food doesn’t have to be fancy or elaborate to taste good. Getting back to basics and making real food with fresh ingredients is often the yummiest and healthiest way to eat. With this in mind my recipe comes from Page 54 of “How to Cook Everything – the Basics” by Mark Bittman. I love this cookbook, and if ever I am in doubt or cooking something for the first time its my go to for basic cooking tips. It has everything in it including, as you can see, “fried eggs”. I love that this recipe is easy to make, its gluten free and low FODMAP, and can easily be doubled or tripled to feed more people. It contains a good amount of veggies and eggs make it a satisfying and nutritious breakfast or lunch. Serving it with a slice of crusty bread would help balance the meal and give you a broad range of different vitamins, mineral and nutrients. Turn oven on and heat to 200 degrees. Heat olive oil in a small oven safe fry pan. Add vegetables and cook for a few minutes. Add spinach, chives, lemon zest and season with salt and pepper. Make 2 wells for the eggs, carefully crack an egg into each well, keeping yolks intact. Squeeze over the juice of ½ a lemon and top with crumbled feta. Place pan in the oven for about 10 minutes, until eggs cookied to your liking. © 2019 Everyday Nutrition. All Rights Reserved.